Nir Eyan is a specialist in designing mobile applications that are addictive. He started his blog about the subject of habits already a few years before publishing Hooked. He is also a popular speaker and mentor. 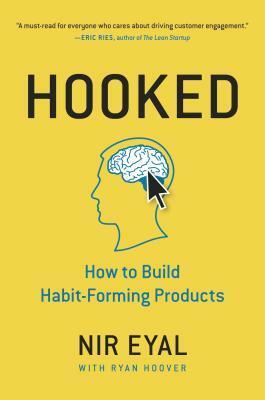 Hooked gained huge popularity in the startup industry, and it’s currently a must-read for everyone designing mobile apps. Nir Eyan has distilled years of research, consulting and practical experience to write a manual for creating products people love. He has taught at the Stanford Graduate School of Business and Hasso Plattner Institute of Design. His writing on technology, psychology and business appears in the Harvard Business Review, The Atlantic, TechCrunch, and Psychology Today. Create a four-step hook model with your product. Understand that a habit is always a painkiller. Find the internal trigger that would cause a user to use your product or service. Design variable rewards in your product. Make your users make an investment in your product. Ensure that you follow correctly all steps of the hook model when designing your product.